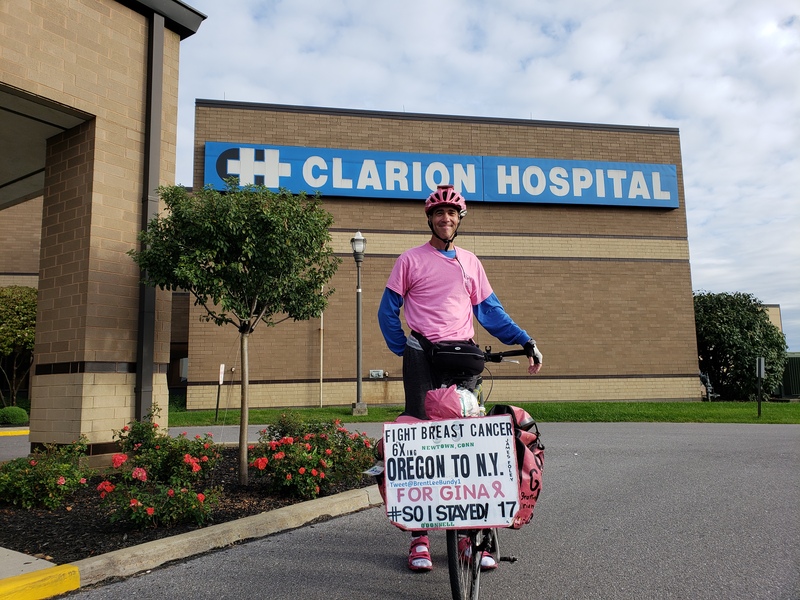 CLARION, Pa. (EYT) – If you happened to recently pass by a man on a bicycle sporting somewhat travel-worn pink saddlebags, you’ve probably already seen cancer warrior Brent Bundy on his annual coast to coast trek for breast cancer awareness. 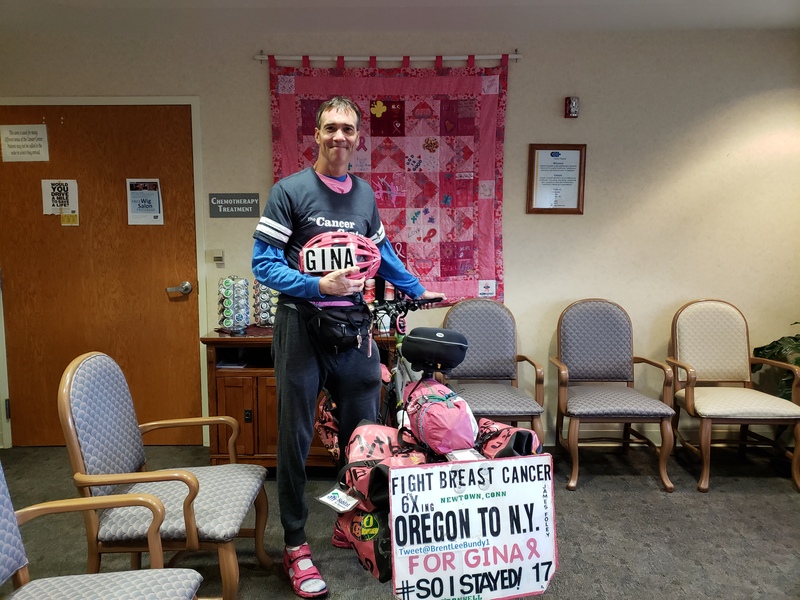 Bundy makes his lengthy trek in honor of his longtime friend, Gina, who lost her battle with breast cancer in 2004, leaving her husband and three children, along with countless other friends and family members, to mourn her loss. “She’s with me,” Bundy noted, showing his helmet which bears a smaller placard with simply the name “Gina” on it. Bundy made his first coast to coast trek in 2006, but it has only become an annual ride over the last four years. 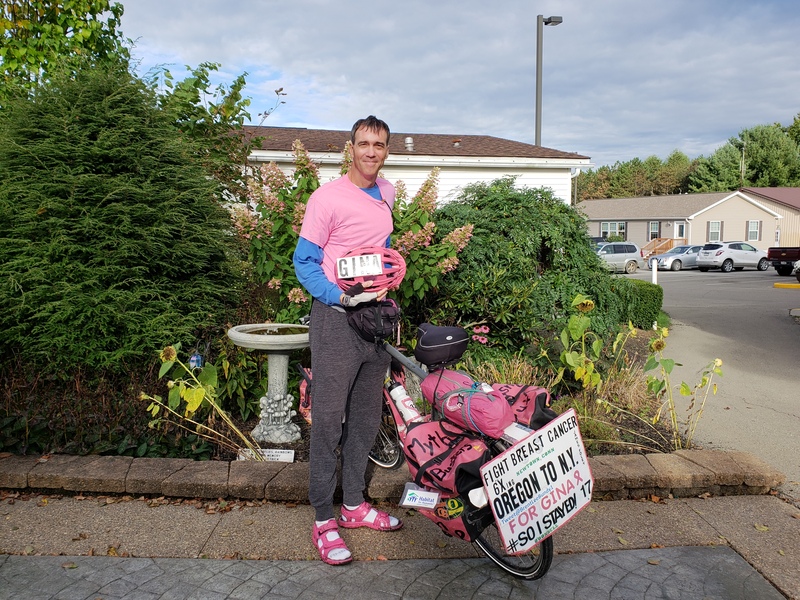 This year, he began on June 1 and intends to reach his last official stop – the Staten Island Breast Imaging Center in New York – by the end of this month. 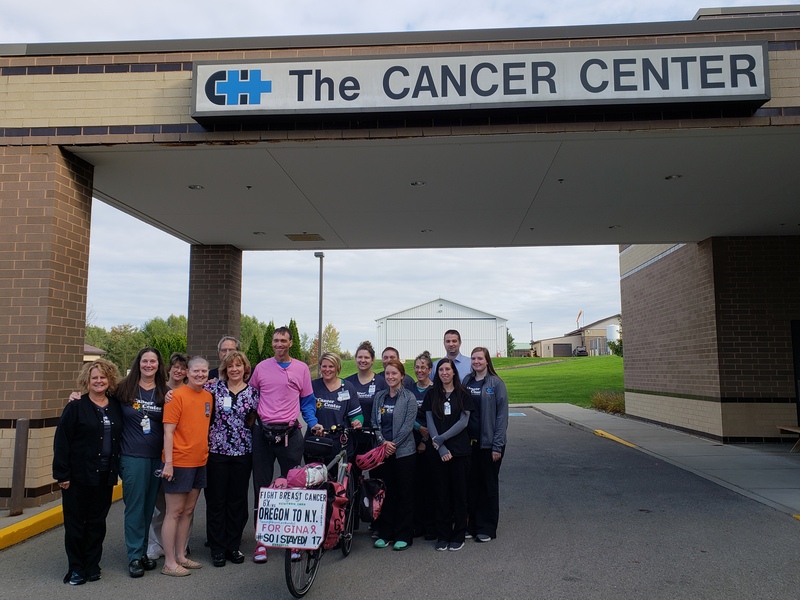 At his stop in Clarion, he met with Clarion Hospital Foundation Director John Stroup, Cancer Center Manager Tracy Myers, and the staff of the Cancer Center, who gave him a Clarion Cancer Center t-shirt in honor of his effort toward breast cancer awareness. Stroup also shared that the timing of Bundy’s visit worked out well, as Clarion Hospital is preparing to kick off a new campaign to raise money for 3D Mammography Equipment to improve early diagnostics. “Yes, catch it early,” Bundy said. Bundy follows the same route each year, attempting to travel as straight as possible from his starting point to his final destination, though he does make short side treks to visit hospitals along the way. He estimates that he has visited about 50 hospitals so far this year. His trek through Pennsylvania holds an interesting history. Although he said he considers it a “good bicycle state,” the hilly terrain has made for a somewhat more difficult segment of the trip. 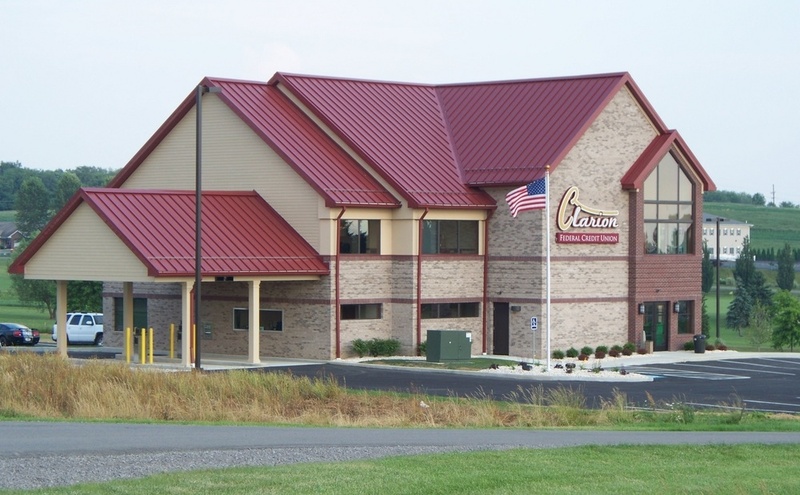 Bundy has had two accidents during his crusades; both were in Pennsylvania. During one trip, he was hit by a car, dislocating his shoulder, and he hit a car with his bicycle during another trip. “If you’re going to go 20,000 miles, you need to expect something,” he noted. He has used the same bike for all six of his trips, racking up over 120,000 miles on the trusty cycle. “One bike, but lots of different tires,” he said, mentioning that after numerous flats over the years, he began using puncture-resistant tires to get him through the long journey. Bundy, who also made a stop in New Castle recently, said he averages about 50 miles per day but has given himself five months to complete the excursion in order to have time to visit as many hospitals as he can along the way. Though 20,000 miles is a long journey, Bundy says he doesn’t consider himself “a real biker” and really prefers jogging. He only decided to make the trip by bicycle after realizing he had too much to carry to do it on foot. Bundy explained that he doesn’t do any special training or make any particular preparations. He starts out slowly, only going about 20 miles per day, then builds up to longer days as he travels. The longest he’s ever traveled in a single day was 160 miles. Bundy said that the kindness of people who see him during his trek and offer him assistance along the way means a great deal to him.